Student researchers (L-R) Rayne Milner, Emilie Camera, Helen Trejo and Schuyler Duffy test out the Fiberizer. In 2016, with the support of Walmart's U.S. Manufacturing Innovation Fund and our Ithaca mayor, Svante Myrick, we were able to experiment and explore the potential for diverting post-consumer textile waste from landfills by creating a fiberizer to give new life to used clothing. Overall, our proposed solution aims to significantly reduce energy and water needs as well as create a closed-loop supply chain model that will support new product manufacture, divert textile waste and enable an additional stream of revenue from reclaimed apparel. Eileen Fisher's successful clothing take back program, Fisher Found (formerly Green Eileen) has been a wonderful source of used clothing for our experiments and we have been able to interact with members of their team to support our research. With my colleagues, Prof. Anil Netravali and Prof. Sheila Danko, along with a talented team of graduate & undergraduate students, we have been able to advance our approaches to product design, manufacturing, fiber science and sustainability in order to tackle the complexities of the apparel supply chain when it comes to environmental issues. Below is a film about the project created by one of the lead research assistants, Helen Trejo, a PhD student in Apparel Design. Helen Trejo is a Ph.D. student in Fiber Science and Apparel Design at Cornell University. Her research focuses on exploring the Farm-to-Fashion value chain with small farms and fiber producing animals such as sheep, alpacas, and angora goats in New York State. She completed her M.A. at Cornell University in 2014, and received her Bachelor's in Fashion Design at the University of California—Davis in 2012. Have you ever wondered how U.S. agriculture and fashion design relate to each other? There are several animal fibers that we can use for clothing and textile design such as wool, mohair, and alpaca fibers to name a few. Wool itself has a lot of variations with the diversity of sheep all with unique qualities. Wool and mohair are the most common animal fibers available in the U.S., but the alpaca fiber industry is also strong. Pendleton and Ralph Lauren are major brands that have supported the domestic fiber industry, and several start-up fashion brands are emerging to further support local farmers and fiber mills. Shearing or combing fibers from the animals is part of caring for the animals, like a yearly haircut to reduce the fleece’s weight on the animal’s body, prevent diseases, and hyperthermia during warm months. Animal fibers are a natural, regenerative resource that invites continual interactions between people, animals, and landscape. Considering small-and-medium sized farms, Fibershed is influenced by the concept of “watershed” and calls for attention to diverse fibers and local labor available in regionalized landscapes. Fibershed was founded in 2011 after the success of Rebecca Burgess’ “One Year One Wardrobe” project. She sourced local fibers and manufactured a wardrobe within 150-miles of her home (1). The Northern California Fibershed encourages farmer, mill owner, artisan, and fashion industry collaboration. It was developed in response to the vast amounts of wool going to waste. The Northern California Fibershed is a leading model for Fibershed Affiliates throughout the world. To date there are 30 different registered U.S. Fibershed Affiliates, and 13 international affiliates. One innovative approach is the One Year One Outfit Fibreshed founded by Nicki Taylor in Australia (2). It encourages makers throughout the world to consider the fiber and manufacturing resources around them, and create an outfit over a one-year time frame. In 2015, there were twenty-two participants from the U.S., Australia, New Zealand, England, and Germany. Most of the farmers that I’ve met sell their fibers directly to customers on their farm, fiber festivals, or online. In early 2015, I was surprised to learn about the wool waste issue in New York when a farmer wrote to me offering over 100 pounds of raw Finn sheep wool. With the low prices offered for wool, it may not be worth it for farmers to go to take their wool to the pools especially if they are focusing their efforts on the sheep meat market. ​In April I had the great honor to meet Kathryn Wojciechowski. She is the founder of the New York Chenango Fibershed, Chenango Wool Works, and Fossil Creek Sheep Farm in Central New York. She helps farmers add value to their unwanted wool and reduce wool waste. Chenango Wool Works is like a “low tech” fiber mill where Kathryn does hand-processing such as washing raw fleeces, carding the fibers to align them, creating batts and roving, dyeing, and hand-spinning fibers into yarns. She is currently partnering with four sheep farms. From one farm, she gets 120 pounds, and sometimes gets that amount twice if there are two shearings. She divides the wool into two batches. One batch is for hand-processing products that will go back to the farmer. The second batch is for her to process and sell through the farmer’s retail venues such as Fiber Festivals or Farmer’s Markets. Through my research I found that there is an abundance of alpacas in New York. In a January 2015 survey that I sent out, 49 out of 89 New York farmers said that they had alpacas on their farm. Alpacas were brought from South America to the United States in the 1980s. The alpaca industry has grown every since. In New York there are over 12,000 Huacaya and Suri alpacas, and 709 farms are registered with the Alpaca Owner’s Association (6). I am amazed by the variety of natural fiber colors available. They range from cream, light browns, and black. It is inspiring to have several color combination possibilities. My love for the colors led me to create a hand-spun and knit Honeycomb Alpaca Scarf (left, modeled by Ibrahim Desooky). The alpaca fibers are from several farms such as Quarry Ridge Alpacas in Salem New York, Riverside Alpacas, and A+ Alpaca Fiber Mill in Jordan New York. I first visited Quarry Ridge Alpacas during the Washington County Fiber Tour in Spring 2015, and came across A+ Fiber Mill during the Empire Farm Days in Summer 2015. It took about a month to make, and I really enjoyed seeing it come to life with the mixture of colors and texture. The memories of seeing the alpacas. meeting the farmers, and mill owners also motivated me to create this scarf. In the future I hope to learn more about the New York fiber community, including farmers, mill owners, wool pool managers, fiber and fashion design entrepreneurs. I hope to see sustainable and socially responsible oriented New York City brands like Eileen Fisher and Zady develop made-to-order, or limited edition lines of clothing and textiles using New York fibers. They can get direct knowledge from the farmers and create a local slow fashion value chain. These brands have very high visibility. 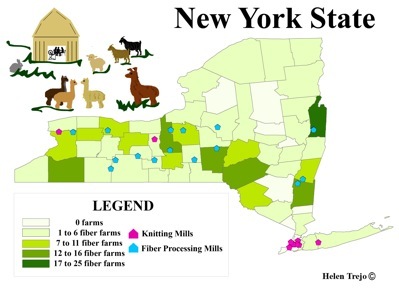 They can garner greater support for New York fiber businesses since a major challenge farmers face is the limited economic profits from their fibers. I have found a few New York brands that are already doing this such as Simply Natural Clothing and Farm2Fashion, which I hope to learn more about.